Do you find a cute mirror for you baby girl? 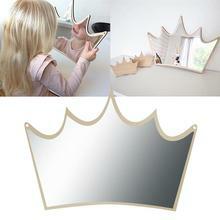 This item is a cute mirror with multi-degree rotation for your choice. It comes with high definition regular on the side. It features an intricate design around this mirror which gives it a special antique look. Wonderful gift for your baby and children. They will love it so much. If you put it on the wall, it is a good decoration for your baby room. Crown shape can make your baby girl feel like a princess. – Cute crown shape can make your children happy. – A beatuiful decoration on the wall. – Exquisite and classic: It features an intricate design around this vanity mirror which gives it a special antique look. – Made of premium material, durable and fadeless. – The base is detachable, convenient for storage and carrying. – With non-slip bottom designed, more stably to stand. – Great for makeup, shaving, dressing, etc.